Advances in molecular techniques have confirmed that melanoma encompasses several neural crest-derived malignancies that cluster in groups with shared features including exposure to known risk factors, histomorphology, mutational/molecular profiles, and clinical behavior. Multiple targeted therapy and immunotherapeutic approaches have advanced the field of melanoma therapy. 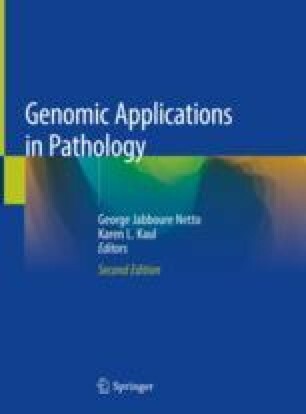 The growing understanding of the mutational and molecular underpinnings of both benign and malignant melanocytic lesions, including the identification of driver mutations such as BRAF p.V600E/K and others, has not only opened multiple opportunities for intervention and revolutionized melanoma therapy but also provided tools for diagnosis and prognostication. In this chapter, we comprehensively review the molecular landscape of melanocytic tumors including the most frequently affected pathways, epigenetic changes, and chromosomal aberrations. Examples of practical application of this knowledge are represented by chromosomal copy number evaluation techniques such as fluorescence in situ hybridization (FISH) and comparative genomic hybridization (CGH) for diagnosis of problematic lesions, gene expression profile for prognostication, and evaluation of tumor neoantigens that could facilitate complete responses with immunotherapy. The applicability of testing will likely continue to grow as targeted therapies are increasingly tested and employed in the adjuvant setting in earlier-stage disease. This chapter represents a brief snapshot of our current understanding of melanoma and some of the approaches currently in use or likely to be deployed in the near future. The authors would like to acknowledge Katheryn Pearce3 and the Division of Cytogenetics for their help with procuring FISH images. Roh W, Chen PL, Reuben A, Spencer CN, Prieto PA, Miller JP, Gopalakrishnan V, Wang F et al. Integrated molecular analysis of tumor biopsies on sequential CTLA-4 and PD-1 blockade reveals markers of response and resistance. Sci Transl Med. 2017;9(379) pii: eaah3560. https://doi.org/10.1126/scitranslmed.aah3560.